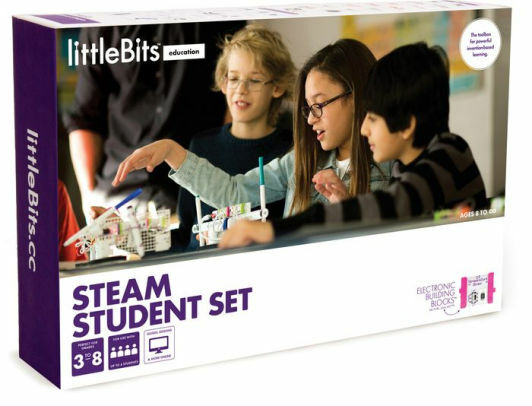 The Little Bits Classroom Kit includes 16 STEAM Student Sets. There are a variety of activities and things to build, varying in time. For the Little Bits Design Challenge, you need about an hour to finish the challenge. Other projects range in time from 30 minutes to two hours. Many projects are about an hour long. 16 STEAM Student Sets with the components sorted into individual bags. The information about the contents of the STEAM Student Kit can be found on the Little Bits website here. The Little Bits Challenge below is a good initial challenge. It is a series of challenges that the students work through that become more complex as they work their way through the list. The instructional booklets also contain many other challenges, which you can view in the online PDF here. Little Bits provides an extensive overview of their product on the website, including videos and sample lesson plans. The webpage here provides an overview of the lessons. The video below provides an overview of what you'll be receiving in the classroom kit, and some tips and tricks.